A dream is a beautiful thing. Everyone has one of their own, regardless whether they have families that support them or not. Even when you have a specific disability that may prevent you to do certain things, your dream shouldn't be bound by it. Following is a wonderful storybook app that was inspired by the real-life art and dreams of Walter and his friends, who live together at a special needs orphanage in Uganda. Living without parents and having badly burned as a young boy, didn't limit Walter to pursue his dream of being a bus driver someday. Walter's Flying Bus follows the dreams of Walter and his friends. The storyline starts when Walter finds an abandoned bus near Lake Victoria where he lives. The bus is in a very bad condition, and the owner has given up hope on it. Walter imagines that he would be able to drive the bus all over the world to pick up children who need a home. He gladly accepts the offer to have the bus when the owner decides to give it up. Shortly after, his friends come over to help him out. Similar to Walter, each of his friends has their own dreams. Debra wants to become a singer, Zeke wants to become a pilot, and Jason wants to have a boat. Everyone is eager to help Walter fulfill his dream of getting the bus up and running. Then, Rachel and her elephant come to help fill the tires with air. They also spray some water to clean up the bus. Mweru arrives with several buckets of paint, allowing Jason and the others to color the bus. Too bad the bus engine will not start! Suddenly, the children are surprised when they feel the bus move. It turns out that Rachel's elephant is pushing the bus so that it moves forward. The elephant continues to push until they pass the village and attract the other children to join Walter's bus. The bus stop to pick up Selina, Zak, and Arafat, who each have their own dreams. Selina dreams of becoming a painter, Zak dreams of having his own farm, and Arafat wants to create music that everyone else around the world can enjoy. As soon as everyone is inside the bus, the elephant gives another push. The bus rolls down the hill, faster than any animals could run. Selina encourages Walter to try starting the bus engine again — this time, it works. Walter then drives the bus into the heart of a nearby jungle, where it gets stuck. A man named Simon comes out, and tells them that that their dreams can carry the bus away to meet their new families. Following Simon's advice, the children paint their dreams on several pieces of clothing and transform them into kites. The bus lifts off the ground, flies over Lake Victoria and lands down on the other side of Rwenzori mountains. People from all over Uganda and the rest of the world come to greet them. Families run up to embrace their children. Walter smiles as he realize how his dream of having a family who will love him forever has come true. Walter dreams of becoming a bus driver that pick up orphaned children to find a home. The characters in the Walter's Flying Bus story are based on real children who are being cared for at the Ekisa orphanage. I highly recommend you to watch the documented series at the end of the story, as they feature an up-close look at the characters and their unique personalities, dreams, and arts. This storybook was designed by the Chosen & Dearly Loved community to tell the story of these special needs orphanage children, and to reach out for help as far as they could. As they look for more people who would be excited to share the app and be engaged in other ways, they have committed to donate all the profits from this app to help the orphans. Walter and his friends let their dreams lift the bus to reach their new families. The app is beautifully illustrated and narrated. Having watched the documentaries, the app really puts the children's art to good use throughout the app. For example, the bus featured in the story is actually an illustration that Walter made to express his dream. “Your family has chosen you! There are many things your family members can't do, and you will inspire them to let nothing hold them back,” Simon replied. “They're missing a rare beauty. Your family will see you for who you are and love you!” replied Simon. Created to help real Ugandan orphans, all proceeds from the app will be donated to find new homes for them. 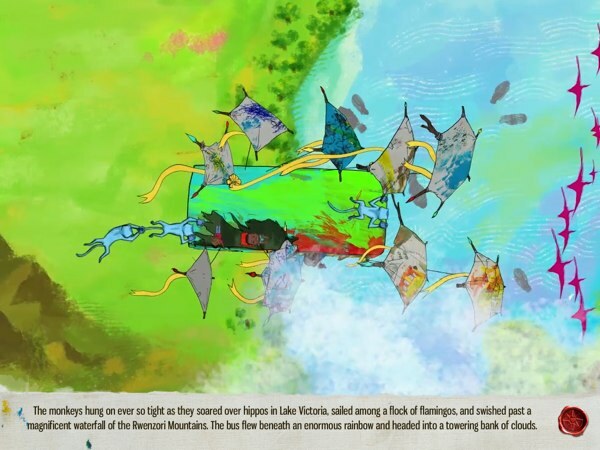 Walter's Flying Bus is a great storybook app built on top of many orphans' dreams. It tells a wonderful story of how powerful a child's dream can be. It reminds us again to provide the single most important thing that our juniors need from us: our never-ending love. If you symphatize with what these orphans are going through, and want to help out, you can start by sharing the information with other parents or people who would love to be a part of the movement. I Love You All The Time. Super sweet tale about parents' unconditional love. Wince - Don't Feed the Worry Bug. Imaginative, child-friendly storybook explores emotions, primarily worry.